Madhya Pradesh is frittered with several destinations boasting a variety of tourist attractions that are rich in spirituality, culture and much more. Khajuraho and Orchha are two of such destinations reflecting the culture, traditions and architectural brilliance of ancient times perfectly. 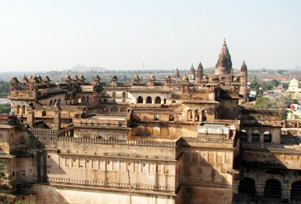 Orchha holds ancient and beautiful monuments dating back to one thousand years. Khajuraho also abodes several beautiful temples are listed in UNESCO World Heritage Sites. This 04 Nights and 05 Days itinerary is a congenial blend of trip to Orchha and Khajuraho. The major highlights of the trip are sound and light show at Orchha, sightseeing at ancient forts in Khajuraho, visiting primeval temples dating back to 10th century and exploring beautifaul fort of Orchha. In few words, the tour is ideal to get soaked in ancient cultural affluence of these two magnificent destinations in Madhya Pradesh. On arrival at Jhansi railway station/airport, meet our representative who will be there for your welcome and thereafter transfer you to your final destination i.e. Orchha. Check in at your already booked hotel in Orchha and get ready to leave for the local sightseeing tour. 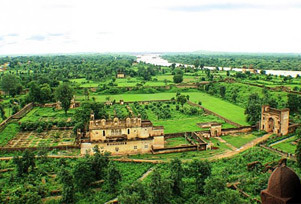 Our day tour to Orchha will include a visit to Phool Bagh, Orchha fort complex, Laxminarayan Temple and Raja Ram Temple. All these are the major attraction of the place and can leave you with a mesmerizing experience. After exploring these places we will return back to the hotel for a relaxing overnight stay. Orchha fort complex is a must visit attraction of town with a number of palaces within it portraying the stories of wonderful past. It is the only place in country where Lord Rama is worshipped as a king and not as a god. Phool Bagh is a stunning garden in Orchha that represents the rich artistic sense of the royal rulers of the Bundelkhand dynasty. It also reflects the natural wonder of the place during the bygone era. Start your day with a healthy breakfast in the hotel. Rest of the day is free for leisure. During your free time, you can either rest in hotel and take pleasure of its modern amenities or explore other interesting places of Orchha such as Orchha Sanctuary, Sunder Mahal, Chaturbhuj Temple, Raj Mahal and Chattris. Later return back to the hotel for a comfortable overnight stay. Sunder Mahal is a gorgeous palace in Orchha which now serves as a major pilgrimage centre for Muslims. This palace belongs to a Hindu king named Prince Dhurbhajan and his Muslim lover. 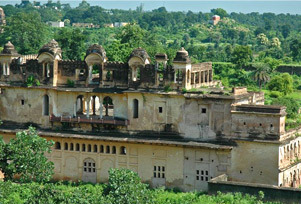 Raj Mahal is one of the famous palaces of Orchha that grab attention of visitors from around the world. It was initially built by Rudra Pratap Singh in the 16th century and completed by his successors. Chattris are basically the tombs of Maharajas which have been positioned on prominent platforms and supported by pillars. 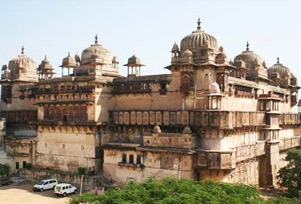 They are designed and structured in a unique way allowing them to enter in the list of major tourist attractions of Orchha. After breakfast in the morning, we will leave from Orchha and drive to Khajuraho. 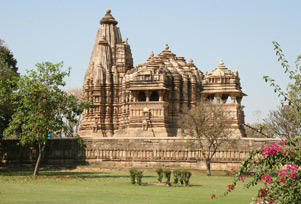 On arrival, check in at your already booked hotel and get ready to leave for the local sightseeing tour of Khajuraho. In our day tour, we will be visiting the legendary temples including Chitragupta Temple, Devi Jagdamba Temple and Adinath Temple that are supposed to be constructed in the 9th and 10th century A.D by Chandela rulers. These temples are famous for their unique and ancient engravings. After witnessing some of the major wonders of Chandela rulers, we will head back to our hotel for an overnight stay. In the morning after breakfast, we will spend our rest of the day in Khajuraho and explore some of its other major attractions such as Kalinjar Fort, Ajaigarh Fort, Vaman Temple and Parsvanth Temple. Later return back to the hotel for a stress bursting overnight stay. Kalinjar Fort is an old fort that was believed to be the heart of the Chandella kingdom in the 10th century. Ajaigarh Fort is an ancient fort that believed to have five gates initially, but now has only two gates, two rock-cut tanks and two temples. In addition, three ruined Jain temples have also been spotted in Ajaigarh fort and are designed in Khajuraho style. On the last day after breakfast, we will check-out from the hotel and head towards the airport/ railway station to catch the flight or board train for onward destination.